Time resolved experiments provides sequance of spectra that requires signal processing to supply the physical or chemical information of interest. Often, basic approaches gives limited information and are time consuming when experiments are very producing. We are also interrested in developping unsuperveised tools. This article presents a method for decomposing a sequence of spectroscopic signals into a sum of peaks whose centers, amplitudes and widths are estimated. Since the peaks exhibit a slow evolution through the sequence, the decomposition is performed jointly on every spectra. To this end, we have developed a Bayesian model where a Markov random field favors a smooth evolution of the peaks through the sequence. The main contribution concerns the estimation of the peak number using the reversible jump MCMC algorithm. We show the accuracy of this approach on synthetic and real data. 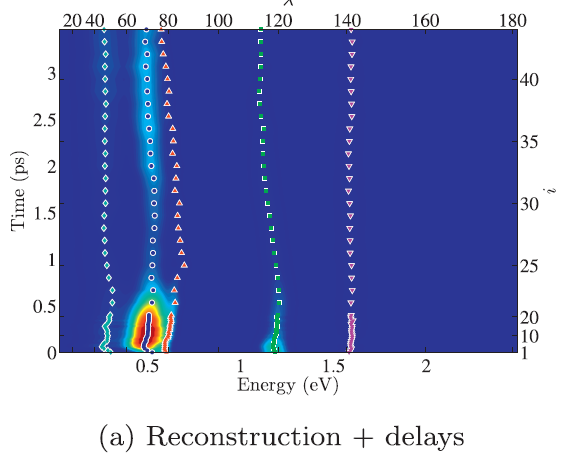 This work deals with the decomposition of a temporal sequence of photoelectron spectra into a sum of peaks whose positions, amplitudes and widths are estimated. Since the peaks exhibit a (slow) evolution with time, the decomposition is performed jointly on the whole sequence to take this temporal information into account. To this end, we have developed a Bayesian model where a Markov random field favors a smooth evolution of peaks. The approach is unsupervised and a Gibbs sampler within a simulated annealing scheme enables to estimate the maximum a posteriori. We show the relevance of this approach compared with a method in which the spectra are decomposed separately and present an application on real photoelectron data. Abstract This paper addresses the problem of decomposing a sequence of spectroscopic signals. Data are a series of signals modeled as a noisy sum of parametric peaks. We aim to estimate the peak parameters given that they change slowly between two contiguous signals. The key idea is to decompose the whole sequence rather than each signal independently. The problem is set within a Bayesian framework. 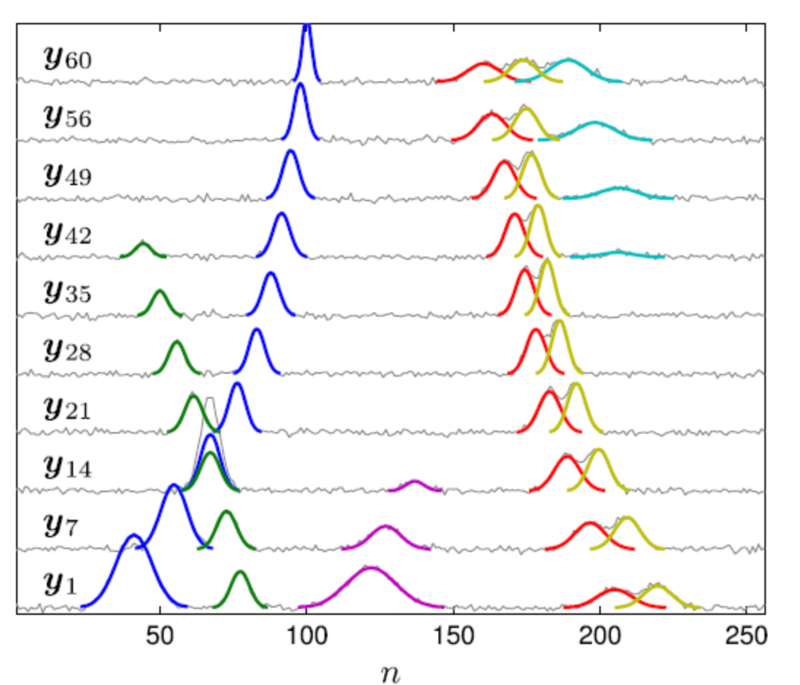 The peaks with similar evolution are gathered into groups and a Markovian prior on the peak parameters of a same group is used to favor a smooth evolution of the peaks. In addition, the peak number and the group number are unknown and have to be estimated (the number of peaks in two contiguous signals change if peaks vanish). Therefore, the posterior distribution is sampled with a reversible jump Markov chain Monte Carlo algorithm. 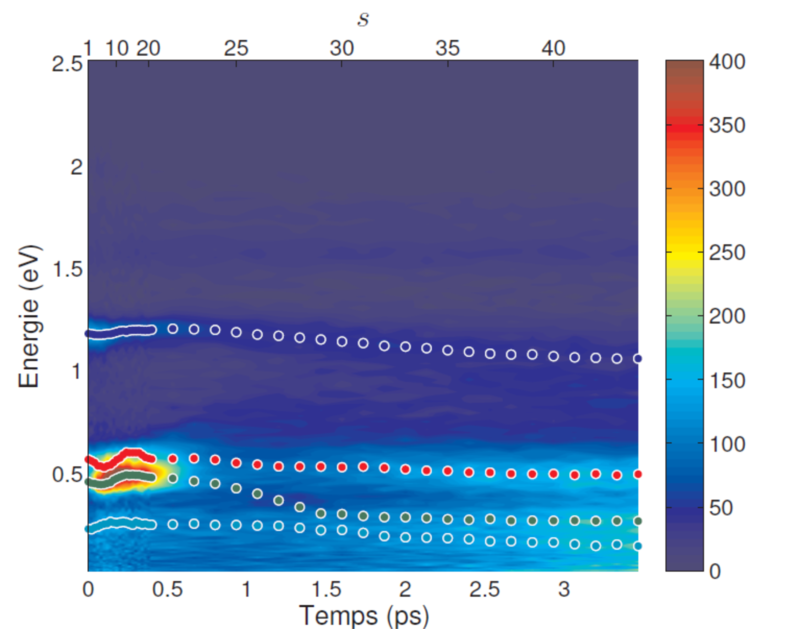 Simulations conducted on synthetic and real photoelectron data illustrate the performance of the method. 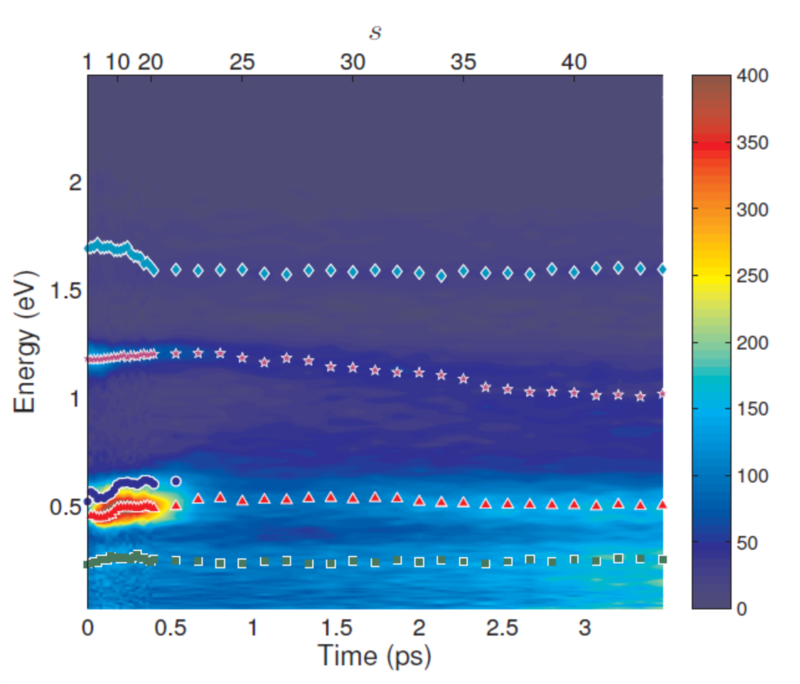 This paper addresses delayed (also known as anechoic) source separation when the source shape can be modeled by parameterized waveforms. An Alternating Least Squares (ALS) scheme is proposed to estimate the source shape parameters in a first step and both the mixing coefficients and the delays in a second step. For the challenging delay parameter estimation step, we adopt a strategy inspired by greedy algorithms. For highly correlated sources, the separation becomes ambiguous, and a second algorithm is proposed: a regularization term is added to favor slow delay evolution within each source. Results on synthetic and real data demonstrate the effectiveness of both algorithms compared to state-of-the-art methods for highly correlated Gaussian waveforms.